You can customize track width, height and track name. You can change the width of the track header. 1) Move the mouse cursor to the right edge of the track header, and drag when the mouse cursor changes shape. You can change the height of the track. 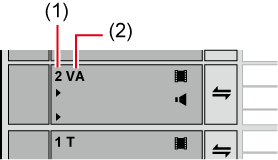 When the track is set higher, the thumbnails indicating clip frames are displayed larger. 1) Move the mouse cursor to the top or bottom edge of the track panel, and drag when the mouse cursor changes shape. Right-click the track panel to change, and click [Height] → desired height. You can also change the height of multiple tracks in a single operation. Select and right-click multiple track panels, and click [Height (Selected Tracks)] → desired height. You can also adjust the height of all tracks in a single operation. Right-click the sequence tab, select [Track Height] and click the desired height. Newly added tracks from now on become the height set by this operation. 1) Right-click the track panel to change, click [Rename] and enter the new name. The sort order of the tracks is always displayed as the track number. Up to 30 characters can be used in the track name, and tracks with the same name also can be used. Track names that exceed the display range can be checked with the tooltip. When a track is copied, the name also is copied.